In late October, flotillas of Chinese warships and submarines sliced through passages in the Japanese archipelago and out into the western Pacific for 15 days of war games. The drills, pitting a "red force" against a "blue force," were the first in this area, combining ships from China's main south, east and north fleets, according to the Chinese military. Land-based bombers and surveillance aircraft also flew missions past Japan to support the navy units. In official commentaries, senior People's Liberation Army (PLA) officers boasted their navy had "dismembered" the so-called first island chain - the arc of islands enclosing China's coastal waters, stretching from the Kuril Islands southward through the Japanese archipelago, Taiwan, the Northern Philippines and down to Borneo. Named Manoeuvre 5, these were no ordinary exercises. They were the latest in a series of increasingly complex and powerful thrusts through the first island chain into the Pacific. For the first time in centuries, China is building a navy that can break out of its confined coastal waters to protect distant sea lanes and counter regional rivals. Beijing's military strategists argue this naval punch is vital if China is to avoid being bottled up behind a barrier of U.S. allies, vulnerable to a repeat of the humiliation suffered at the hands of seafaring Europeans and Japanese through the colonial period. 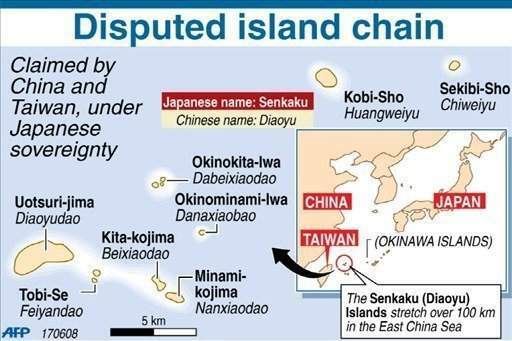 "It tells Japan and the United States that they are not able to contain China within the first island chain," says Shen Dingli, a security expert and professor at Shanghai's Fudan University. "So don't bet on their chances to do so at a time of crisis." In the process, the rapidly expanding PLA navy (PLAN) is driving a seismic shift in Asia's military balance. China, traditionally an inwardly focused continental power, is becoming a seagoing giant with a powerful navy to complement its huge ship-borne trade. "As China grows, China's maritime power also grows," says Ren Xiao, director of the Centre for the Study of Chinese Foreign Policy at Fudan University and a former Chinese diplomat posted to Japan. "China's neighboring countries should be prepared and become accustomed to this." China's strongly nationalistic Communist Party leader, Xi Jinping, has thrown his personal weight behind the maritime strategy. In a speech to the Politburo in the summer, Xi said the oceans would play an increasingly important role this century in China's economic development, according to accounts of his remarks published in the state-controlled media. "We love peace and will remain on a path of peaceful development but that doesn't mean giving up our rights, especially involving the nation's core interests," he was quoted as saying by the official Xinhua News Agency. over a disputed group of islands in the East China Sea. China is also making waves in the South China Sea, where it has territorial disputes with a number of littoral states. But it is the pace and tempo of its deployments and exercises around Japan that provide the clearest evidence of Beijing's "blue water" ambitions. Fleets of pale grey, PLA warships are a now a permanent presence near or passing through the Japanese islands. 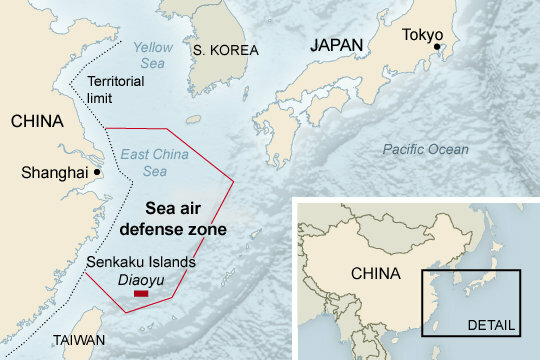 An acrimonious standoff over a rocky jumble of disputed islands in the East China Sea, known as the Senkakus in Japan and Diaoyu in China, has given China an opportunity to flex its new maritime muscle. Beijing has deployed paramilitary flotillas and surveillance aircraft to this zone for more than a year, where they jostle with Japanese counterparts. Tension flared dangerously last week when China imposed a new air defense zone over the islands, demanding that foreign aircraft lodge flight plans with Beijing before entering this area. In defiance of the zone on Tuesday, two unarmed U.S. B-52 bombers on a training mission flew over the islands without informing Beijing. The flight did not prompt a response from China. "The policy announced by the Chinese over the weekend is unnecessarily inflammatory," White House spokesman Josh Earnest told reporters in California, where President Barack Obama is traveling. Washington and Tokyo immediately signaled they would ignore the restriction. The Obama administration also reminded China that the treaty obliging the United States to defend Japan if it came under attack also covered the disputed islands. Particularly unnerving for Tokyo are the increasingly common transits of powerful Chinese naval squadrons through the narrowest straits of the Japanese archipelago, sometimes within sight of land. This puts East Asia's two economic giants, both with potent navies, in direct military competition for the first time since the 1945 surrender of Japan's two million-strong invasion force in China. Drawing on a reservoir of bitterness over that earlier conflict, the demeanor of both sides signals this is a dangerous moment as U.S. naval dominance in Asia wanes. Even if both sides exercise restraint, the risk of an accidental clash or conflict is ever present. "China and Japan have to come to terms with the fact that their militaries will operate in close proximity to each other," says James Holmes, a maritime strategist at the U.S. Naval War College in Newport, Rhode Island, and a former U.S. Navy surface warfare officer. "Geography compels them to do so." As the Manoeuvre 5 drills got under way, PLA Senior Colonel Du Wenlong said he was looking forward to units from the three regional Chinese fleets simultaneously crossing three key chokepoints - two through the Japanese islands, and one between Taiwan and the Philippines, according to reports in the official Chinese military media. It is unclear if the warships performed a coordinated transit. But the exercises and the response of the Japanese military contributed to a spike in tension. "The PLAN has cut up the whole island chain into multiple sections so that the so-called island chains are no longer existent," Colonel Du was quoted as saying. In this and earlier exercises, the PLA provided daily commentaries and details of the ships, courses and drills, with pointed mention of transit points past Japan. PLA officers or military commentators, in typical communiqués, say China has "demolished" or "fragmented" the island chain in a "breakthrough" into the Pacific - language that suggests the crossings are somehow opposed rather than legal transits through international waters. Tokyo dispatched warships and aircraft to track and monitor the Chinese fleet in response to the latest drills. Japanese fighters also scrambled to meet Chinese bombers and patrol aircraft as they flew out to the exercises and back. Japan's defense ministry later released surveillance photographs of a Chinese H6 bomber flying between Okinawa and Miyako Island on October 26. All this attention clearly irritated the PLA leadership. Beijing accused Japan of a "dangerous provocation" and lodged a formal diplomatic protest, complaining that a Japanese warship and aircraft disrupted a live fire exercise. While the drills were under way, Japanese Prime Minister Shinzo Abe warned that his country would not be bullied. "We will express our intention as a state not to tolerate a change in the status quo by force," he told a military audience on October 27." "We must conduct all sorts of activities such as surveillance and intelligence for that purpose." Naval commentators suggest the bellicose rhetoric shows that both sides are struggling to adjust to their new rivalry. "Chinese hardliners do regional tranquility no service by talking about splitting Japan and so forth," says American naval strategist Holmes, co-author of an influential book on China's maritime rise, "Red Star Over the Pacific," with colleague Toshi Yoshihara. "And, the Japanese do regional tranquility no service by being alarmed when China's navy transits international straits in a perfectly lawful manner." Part of the problem for Japan is that it has been slow to adjust to China's rise, according to some Chinese foreign policy analysts, and is now excessively anxious. "For so many years they looked down upon China which was big but weak," says Ren, the former Chinese diplomat. "Now the situation is different and they have to face up to the new reality." 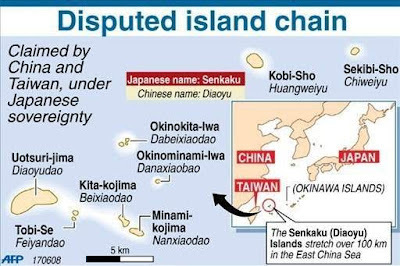 Some senior Japanese officers accept that China is within its rights to traverse international waters between the Japanese islands. Likewise, they say, the Japanese are entitled to track and monitor these movements and exercises. "The Japanese Self Defense Force's reaction is also in full compliance with international laws, regulations and customs," says retired Vice Admiral Yoji Koda, a former top Japanese naval commander. Koda adds that the Japanese military routinely monitors Russian naval operations around Japan without friction or protest. The ideological keel of Beijing's modern bid to become a maritime power was laid down as China's economic revival in the early 1980s flowed through into sharply increased military budgets. The starting point for China's leading maritime thinkers is the trauma of European and Japanese colonization. "The Qing Dynasty was badly defeated in naval warfare by overseas imperialist powers, leading to the decline and fall of the dynasty," wrote Zhang Wenmu, a professor at Beijing University of Aeronautics and Astronautics, in a 2010 article published in China's official state media. Another premier Chinese maritime strategist is Ni Lexiong, a professor at Shanghai's University of Political Science and Law. He has documented how China's failure to properly fund its navy was a factor in its 1895 defeat in the first Sino-Japanese war and the subsequent loss of Taiwan. Zhang and Ni are regarded as China's leading advocates of the theories of the American naval officer, strategist and historian Alfred Thayer Mahan. Both subscribe to one of Mahan's principal ideas: A truly powerful nation must have thriving international trade, a merchant fleet to carry these goods and a strong navy to protect its sea lanes. Mahan's works, considered visionary in the late 19th and early 20th centuries, are still avidly read and absorbed in Chinese naval schools, Chinese military analysts say. The rise of earlier seafaring and trading powers - Portugal, Spain, Holland, Great Britain, the United States and Japan - have also provided important lessons for strategic thinkers. The vision and influence of the late Admiral Liu Huaqing, known as the father of the modern Chinese navy, also remains strong. Liu, who died in 2011, rose to become overall commander of the PLA and a member of the Communist Party's Politburo standing committee, the country's supreme ruling body. While Liu was head of the navy in the 1980s, it was an obsolete, coastal fleet. But Liu was determined that China needed a blue-water fleet and aircraft carriers if it was to match the power of the United States and its allies. Fundamental to the thinking of many Chinese strategists and military and political leaders is the conviction that China would be foolish to rely on the United States to protect its shipping. They acknowledge that the U.S. Navy has guaranteed freedom of navigation since the end of World War Two, underwriting an explosion in global trade to the benefit of most other countries, including China. The figures bear this out. China last year overtook the United States as the world's biggest trader, according to official data from both countries. Up to 90 percent of Chinese trade is carried by sea, including most of its vital imports of energy and raw materials, shipping experts estimate. But Beijing's strategists fear the U.S. could interrupt this trade at a time of crisis or conflict. Almost all of China's naval thinkers also agree that recovering Taiwan is crucial to realizing the dream of maritime power. Restoring "national unity" is a longstanding goal of the ruling Communist Party. But the self-governing island itself has immense strategic value, sitting astride sea lanes that are also vital for Japan and South Korea. Control of Taiwan would open a huge breach in the first island chain around China. PLA warships and aircraft based on the island could extend China's military reach far into the Pacific and much closer to Japan, without the need to first pass through potential choke points or channels in the chain. "Taiwan is a part of the first island chain," says Fudan University's Shen. "Instead of being integrated into mainland China, it has been used as a part of the U.S. first island chain strategy." China's turn to the sea has boosted the status of the navy, long the poor relation of the armed forces. The PLA, traditionally a massive ground force, was built around the Maoist strategy of drawing an invading enemy deep into the hinterland, where it could be destroyed through attrition. Military strategists say this was thinkable before the country industrialized. Now that the eastern seaboard is the throbbing engine of the world's second-ranked economy, fighting a war here would be catastrophic for China, win or lose, they say. Far better to meet challenges at sea or on the territory of a hostile nation. The late Admiral Liu is credited with sharply increasing the navy's share of the defense budget, outlays that have paid for a rapidly expanding fleet. In its annual assessment of the Chinese military published earlier this year, the Pentagon said the Chinese navy, now the biggest in Asia, deployed 79 major surface warships and more than 55 submarines, among other vessels. And the PLAN last year commissioned its first aircraft carrier. Wu Shengli, the powerful admiral who now leads this force, is widely regarded as the most influential naval officer since Admiral Liu. Wu is also a member of the Central Military Commission, China's top military council. PLAN warships are now highly visible in all major oceans, with an active schedule of ship visits to foreign ports. The Chinese navy is part of the international anti-piracy force in the Gulf of Aden. These deployments are heavily publicized in the state-controlled media as the navy becomes a symbol of China's growing international prestige. This openness also applies to combat exercises. The U.S. and other major powers routinely chastise China for a lack of transparency surrounding its three-decade military build-up. But it is difficult to accuse Beijing of secrecy when it comes to recent naval operations near Japan. The state-run media and a stable of specialist military newspapers, journals, web-sites and television channels devote blanket coverage to the deployment of warships, submarines, aircraft and patrol vessels on missions near China's neighbor. Some military commentators say Japan shouldn't overreact to these messages, as they are primarily aimed at a domestic Chinese audience. "The PLAN is a relatively young organization building up their capabilities and certainly not the ‘senior service' in China," says Alessio Patalano, a specialist on the Japanese military at King's College in London. "It's important for its leadership and its members to establish their credentials and increase their profile." For exercise Manoeuvre 5, the Chinese navy followed the U.S. practice of embedding journalists. Regular television reports from the Type-052 guided missile destroyer Guangzhou showed the 6,500 ton warship ploughing through heavy seas on route to the exercises. Officers and sailors were interviewed at battle stations while they tracked targets and prepared missile launches. Tokyo is keeping careful score. In its latest Defense White Paper, published in July, the Japanese military charted steadily expanding PLA deployments near Japan since 2008, documenting bigger visiting fleets, more powerful warships and increasingly complex exercises involving helicopters, support vessels and land-based aircraft. "Map of Tokara Islands and Senkaku Islands", issued in Japan, 1933. After decades confined to its coastal seas, the PLAN began regular voyages from the East China Sea into the Pacific early last decade. At first, Chinese warships mostly used the wide Miyako Strait between Okinawa and Miyako Island, according to statements from the Chinese and Japanese militaries. Since then, in a series of firsts, they have transited all the other important channels between the Japanese islands, according to Japan's White Paper. In July, five PLA warships steamed out of the Sea of Japan through the Soya Strait, known as the La Perouse Strait in Russia, which divides the Russian island of Sakhalin and Hokkaido. The Chinese fleet continued on around the Japanese islands and back to China. "The move marks the first trip by the Chinese navy circumnavigating the Japanese archipelago," said a report on China's official military website. Some Chinese strategists reject fears that deploying a powerful navy increases the odds of conflict. "I am more confident than many outside observers that China will behave out of the nation's fundamental interests, namely, to take a path of peaceful development," says Ren. "There is no reason to change this option." For Japan, there might even be an upside. Chinese warships used to be mostly confined to home waters, and thus hidden. Now, they can now be monitored. "The more exercises the PLAN conducts on the high seas around Japan, the better for the JMSDF to judge and collect the PLAN's warfare capabilities and intents," says Koda, the retired Japanese admiral. "The PLAN cannot intimidate Japan by these types of exercises."